Last week at work, a friend and I were discussing an acquaintance of mine in Russia: a "seer." I had been introduced to the seer last summer by someone who swore by her talents and "influence," even from far away. I was feeling some unwanted (and uncomfortable) sway, so my friend and I took a walk in Little Saigon. As I was vividly imagining the seer forgetting all about my existence, a woman approached me on the street and screamed in my ear: "YOU BELONG TO ME!" Her hateful shriek made my head go momentarily numb on the side that faced her. Back at work, my friend and I, feeling a bit incredulous and shaken, discussed witches, amulets, tarot cards and runes, and I Googled a famous psychic from Seattle who I had met ages ago...to find that she had died in 2013. When I got home that same day, on my porch was a package from Louisiana sent by a perfume company called MojoMagique; it was filled with fragrances called Magique, VooDooChild, PixieRose and...SEER.1 Guess which one I opened and tried first? MojoMagique Seer goes on smelling grassy-green, but sweet; its opening reminds me of an old-fashioned men's cologne from the '60s. (Since I've been talking about seers and such, I guess I should specify the NINETEEN-sixties). For a minute or so, Seer begins to toss one note after another into the air: a floral bit here, some smooth/warm woods there, a touch of saffron, evergreen, clove. Then...something great happens; Seer conjures a wonderful scent memory for me. In the Tidewater region of Virginia (all round the Chesapeake Bay) people have, for centuries, created trails, roads and garden paths using oyster and clam shells. These paths gleam in the sun as the glassy inner shells shine, and I love the crunch of driving over or walking on an oyster-shell lane or walkway. Best of all (and what Seer reproduces): the pungent "marsh mud," mineral, sea smell of these shells — salty/sandy with a twang of fleshy musk. Seer's base smells of spicy woods, with hints of the "shell" accord I love so much. The day after I received Seer in the mail, I told my friend at work about it and she said: "It came to you at the right moment...a positive development in an otherwise worrisome day!" Dare I say Seer is almost "magical?" MojoMagique Seer is $125 for 100 ml Eau de Toilette or $21 for a 10 ml roll-on at the brand webstore. 1. Perfumer: Pascal Gaurin; listed notes of pine, herbs, wood, leather, saffron, osmanthus. 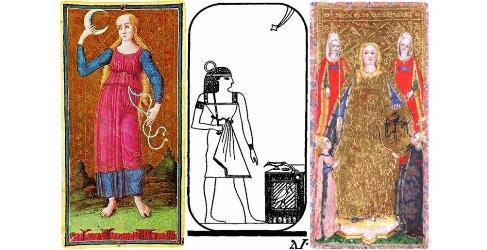 Note: top images of tarot cards via Wikimedia Commons: Magician (center); Empress (right); and Moon (left). MojoMagic sounds really wonderful! I am trying to conjur the lovely marsh of your childhood! How do you think those notes compare to the original AG Vetiver that also had some of that earthy beach smell? Anyone who might run up to you and yell into your ear, witch, crazy pshyco, teenager, etc, would probably have the same affect. Its the adrenaline from the shock of unexpected that makes you get shaken, not some powers. I’m not saying I don’t believe some people can have powers, but still. Years ago some Native American guy, probably in his 30s, who was showing off to his friends got very close to my face in the crowd at the PDX Saturday Market, and started speaking to me in some NA language very loudly as if he was either putting a spell on me or saying something rather vulgar, or both. It was as bit of a shock b/c he just got in my face, but whatever he was trying to do was totally worthless. AnnS…this is more earthy in character than the Goutal…which I also like. And, yes…we all have our own POWER! By the Druidic powers invested in me, I herebye release you from from unwanted supernatural influences! Seer sounds really intriguing – and now I also want to visit Chesapeake Bay. Merlin…many thanks (and visit Tidewater in any season but summer)! Archeologists appreciate shells, since seafood eaters discard them and they last forever. Shell middens, for example, indicate the site of prehistoric human settlements. Those Tidewater shell trails will be a wonderful find for archeologists of the future! One of my favorite perfumes is Aftelier Tango, which has choya nakh, an Indian essence distilled from burnt seashells. 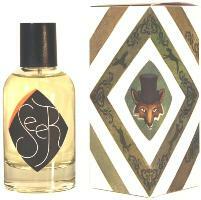 Seer sounds enchanting, and the 10-ml rollerball means I am destined to investigate. I live in Tidewater or Soontobeunderwater as I have affectionately dubbed it! I know that smell and it is hard to find in perfumery. I also love the muddy, fecund smell of tidal swamps when the tide is out. It smells like oysters taste! I shall have to give this line a try as I am intrigued…..
Sk…true, that area won’t fare well as oceans rise! Kevin, the story is awesome and I love your tarot triptyque. Want to walk on those shell paved paths someday! (Only the perfume does not sound like my cup of tea.) Anyway, this Monday they had emptied the water mirror around the building where I work (because of the Zika virus epidemic), and workers were mopping it (whole lotta mopping). Then it suddenly felt wonderful and beachy and youthful, when I realized it was smelling like mangrove. Deliciously gross! Solanace…I know what you mean…a great scent!